Running Press Kids, 9780762455065, 32pp. 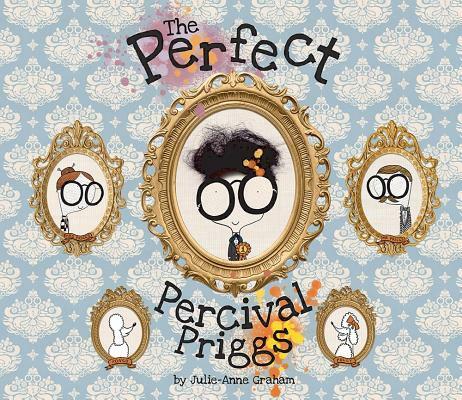 Percival Priggs wants to be the perfect child in order to please his seemingly perfect parents. But even when Percy gets his family into a mess of a situation, his parents' love for him remains absolute perfection. Originally from Belfast, Northern Ireland, Julie-Anne Graham is a graduate of the MA in Children's Book Illustration at Cambridge School of Art. Just like Percy, she has many loves, and she dances, doodles, stitches, and makes stories in London, England. She would love to win awards for jelly juggling and dragon taming. "Graham's sweetly odd characters, goth-lite vibe, and gift for exaggeration may remind readers of offbeat fare such as Coraline or James and the Giant Peach. . . . [R]eaders will come away recognizing the value in not letting the perfect be the enemy of the good, as well as investing energy in pursuits one actually enjoys." "This story is witty and reassuring and features brilliant visual details." "Hilarious details are scattered cleverly throughout this story, which is sure to become a favorite." "The mixed-media illustrations create a world that is quirky yet familiar as Percival learns about acceptance."